On Sunday, December 3, 2017 at 4:22 p.m., the Galloway Township Police Department responded to the 100 block of Oxford Court in reference to the report of a missing person. While police were responding to the scene, they received more information indicating that an 85 year old male suffering from dementia walked away from his residence. The male was wearing pajamas and was missing for approximately 45 minutes. 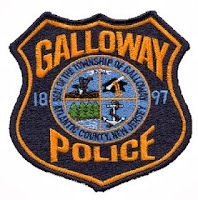 Numerous resources were called to the scene to assist with the search including members of The Galloway Township Fire Department, Galloway Township EMS, K-9 Units, and neighboring police agencies. Our Lady of Perpetual Help Parish assisted the responding agencies by allowing their parking area to be utilized as a command post. As the search commenced, the 85 year old male was located by Officer Jeremy Feliciano approximately one mile from his home. The Atlantic County Sheriff’s Office currently offers a program titled “Project Lifesaver” to aid victims and families suffering from Alzheimer ’s disease or disorders such as Dementia, Down’s Syndrome or Autism. The Project Lifesaver program provides people who are part of the program with a personalized ID bracelet that emits a tracking signal. When caregivers notify their local Project Lifesaver agency that a person is missing, a search and rescue team responds to the area and starts searching utilizing a mobile locater tracking system. The bracelet is a one-ounce battery-operated radio transmitter that emits an automatic tracking signal every second, 24 hours a day. The signal can be tracked on the ground or in the area over several miles. Each bracelet has a unique radio frequency that allows the search team to positively locate and identify the person who as wandered away from their home or care facility. Any of our local residents who have a family member that may benefit from this program are asked to contact The Atlantic County Sheriff’s Office.